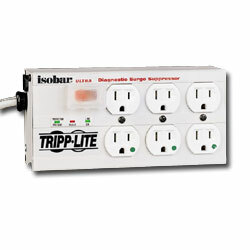 6 Receptacle Isobar Surge Suppressor Constructed of high quality components, near indestructible all-metal case, and unique noise filtration system. The Isobar offers the highest level of protection attainable in a multi-outlet strip. Robust surge suppression circuits with sine-wave tracking offer extreme levels of protection against the heaviest normal mode surge conditions.